Amazon's tablet offerings have gone from rather uninteresting to impressive in the last few years. All they had to do was make them really, really, cheap. 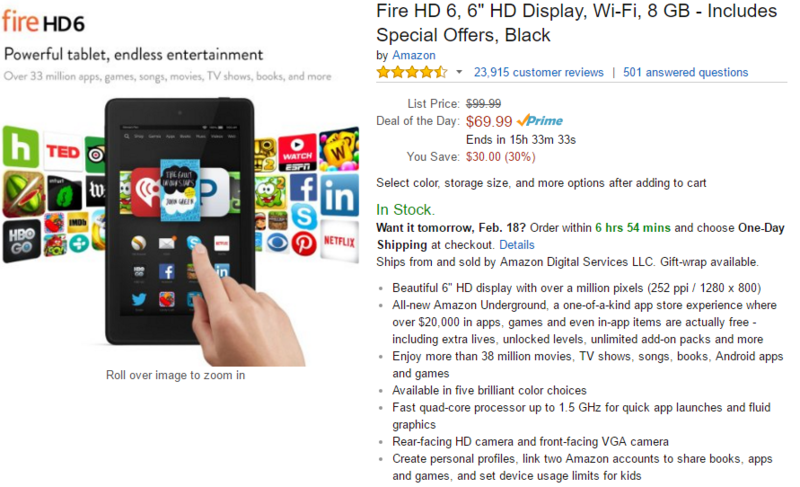 Last year's Fire HD 6 is on sale today, making it even cheaper than usual. It's selling for $69.99 today, down from the usual price of $100. The Fire HD 6 has a 6-inch 1280x800 screen that actually performs quite well. There's only 8GB of storage in the base model, but the 16GB is on sale too for $30 off. That one works out to $89.99. This deal is also valid on the black version of the tablet only. Amazon now sells a $50 version of the Fire, but the HD 6 is a little better across the board, including a higher resolution display and faster internals. Just a reminder, this tablet runs Amazon's Android build, so you don't have access to Google apps and services. The sale only runs through the end of today.